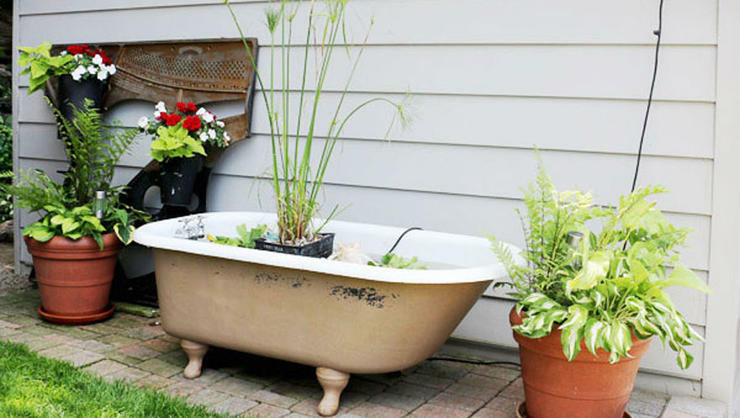 We’ve found some outdoor projects that will stretch your creativity and put your gardening know-how to the test. Click through to get inspired. Cement lawn ornaments are best suited to your grandmother’s front yard. 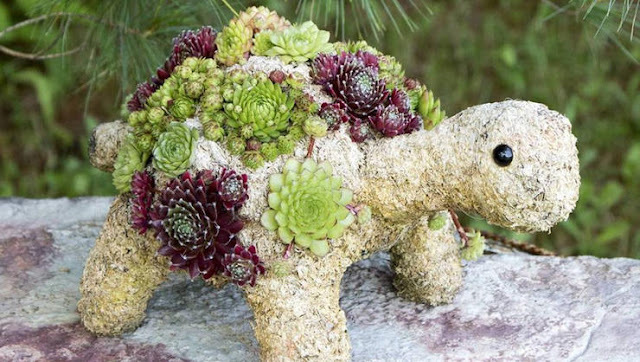 The folks at Simply Succulents breathe new life into the idea by making a living one from succulents and moss in the shape of an adorable baby turtle. Watch it come to life in this video. Melissa J. Will, aka The Empress of Dirt, explains how to rig up an old claw-foot tub with a pump and filter to transform it into an above-ground garden pond. A variety of aquatic plants finish it off. 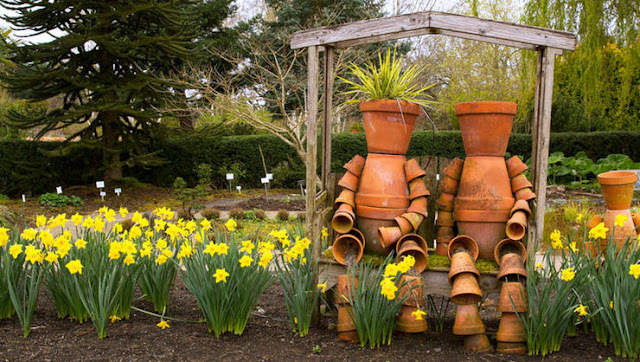 Photographer Anna Calvert came across these charming fellows at the Oregon Garden. Once you Clean Up Your Crusty Terra Cotta Pots, you’ll be set to make a pot person of your own. Directions from Weed It & Reap are a good place to get started. 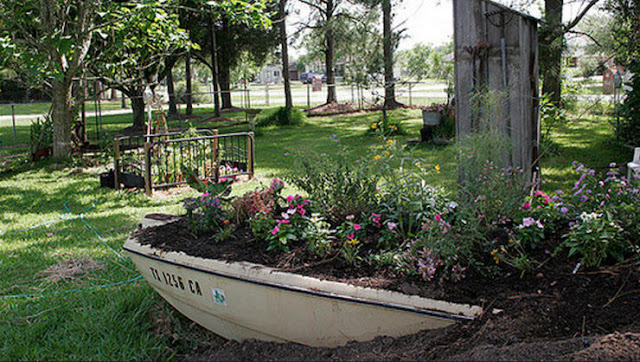 Texas gardener Marilyn Tomalavage upcycled an old motorboat by turning it into a raised flowerbed. It blends perfectly into the landscape of her backyard. Now that’s what we call thinking outside the box. We’ve all heard of living walls, but what about living tables? 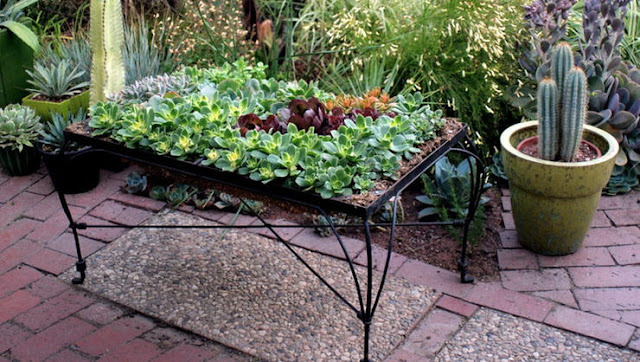 Garden blogger Denise Maher devised this gorgeous one because she needed to do something with all the thinnings from her succulents. It turned out that the shallow bed of this old wrought-iron table was just the thing. She affixed wire mesh to the bottom of the frame and filled it with a layer of moss before adding potting soil. See exactly how it’s done at A Growing Obsession.